O'Reilly Auto Parts Friday Night Drags at Atlanta Motor Speedway is the place to be if you have a need for speed. 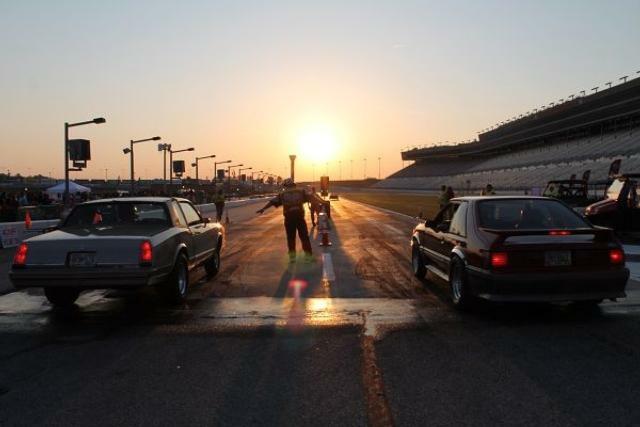 The famous speedway's 1/8 mile pit lane drag strip hosts competitive street-style drag racing in a safe, controlled setting on Friday nights during the summer. "There's a safe environment for them to race and that's exactly where we want them to be: at Atlanta Motor Speedway in a controlled environment where people can enjoy it in a safe way," Henry County Sheriff Keith McBrayer said. Drag racing at AMS is open to any driver and any type of vehicle. Entry fees are just $20; drivers are required to have a working seat belt and a DOT-approved helmet to race. Participating drivers and their rides are placed into one of 18 divisions of similar type vehicles allowing for close, competitive racing. Atlanta Motor Speedway's crew makes sure all the racing is organized with emergency personnel at the ready should anyone need assistance. This Friday night is the 2018 season finale for the O'Reilly Auto Parts Friday Night Drags and will be the deciding event for competitors locked into tight title fights; all champions will receive a pair of passes to the NHRA Carolina Nationals at zMAX Dragway in Concord, N.C., this October. Title fights in several divisions remain close; none are closer than the Harbin's Mechanical Services Street Outlaw division, which has two competitors tied heading into the final week of racing. Entering last week's action, Mike Moore of Peachtree City trailed Wayne Harris of Griffin by two points for the championship lead. Moore's 2017 COPO Camaro beat Harris' 1968 Camaro in a semifinal matchup and went on to win by inches in the final round, earning Moore max points and vaulting him into a tie with Harris. Looking ahead to championship week, Moore said whoever comes out on top will need to bring their A-game. "Everybody out here is pretty good," Moore said. "If you're on perfectly then you can do good, but if you're off a little bit - and they're on - who knows." Another notable title fight is in the Sport Compact division, where just two points separate championship leader Heather Utt, of Fayetteville, and Tyler Hatchett, of Griffin. While several championships remain up for grabs, some high performers have already clinched their division titles and will look to sweeten championship night with one more win to finish the season. Among the notables in this category is Kevin Mayo, of McDonough, who holds a commanding 10 point lead in QuikTrip Pro Division standings. Chad Greenway, of Conyers, has locked up the Diamond Resorts Factory Street Division, and David Smith, of Jackson, has clinched the Harding Heating, Plumbing & Cooling Domestic Division title. Gates for both spectators and Show-N-Shine participants open at 6:30 p.m., and the speedway cruise gets underway at 8 p.m. Eliminations in O'Reilly Auto Parts Friday Night Drags Week 15 get underway after 9 p.m., as some of the fastest racing in Georgia across 18 different divisions hits the pit lane drag strip in a high-octane battle for a trophy, bragging rights and season championship points. Competing vehicles range from supercharged cars to stock vehicles, daily drivers and even motorcycles and ATVs.